Ted Nugent is back with a full length studio album, his first with Spitfire Records. Following the same path as other Spitfire artists, Ted Nugent has adopted a more modern, heavier sound that what we have heard from the Motorcity Madman in the past. I was a bit worried when I started the CD and listened to the opening track, "Klusterfuck Me." Ted handles the lead vocal duties on his latest CD, but the opening track features angry vocals that are shouted and even screamed. This, combined with the downtuned guitars give off too much of a nu vibe for me. Thanfully, the album takes a turn for more classic Nuge sound from here. I must say that I am not particularly impressed with Nuge's vocal performance on this CD. Rather than singing, his borders on screaming and/or shouting at times which might be better suited for a hardore band: this vocal style just doesn't sound right for the guitar rock that Ted Nugent plays. This happens more during the first half of the CD as the second half of the CD shows a more restrained vocal delivery. The restrained vocals are just as energetic and emotional as the screams, but they fit much, much better with the music! The songs themselves are full of crunchy riffs and hard driving grooves that you have come to expect from Ted Nugent. Most of the songs are catchy, very energetic and inspired, however there are three or four filler tracks that detract from the album. At fourteen tracks, deletion of the three or four weakest tracks would have helped the album without making it too short. The songs remain true to the classic Nugent sound (except the opening track), yet the production and the down tuned guitars give this album a heavier, modern edge. The raw energy of this album and the fantastic guitar work are both highlights of the album, but Ted's vocal performance dampens the overall enjoyment for me a bit. 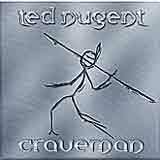 Aside from a few skip worthy tracks, Ted Nugent delivers a nice slab of blistering guitar based heavy metal with Craveman. While he may not have the best voice around, his guitar talent cannot be denied. I think the use of a full time lead vocalist would be a big help, but I'm sure there are just as many Nuge fans out there that think otherwise.